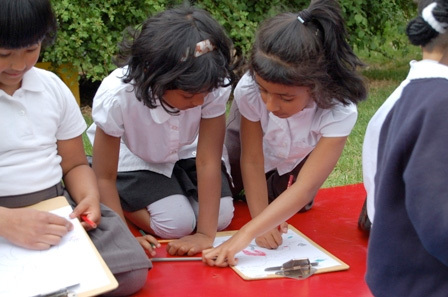 The Environmental Encounters programme is a series of curriculum-linked, outdoor-based learning sessions, focusing on science and geography topics for key stage one and two. These sessions are primarily run throughout the summer term (though they have been used in Spring and Autumn too) at Minet Country Park, but could be applied to any nature reserve or country park to which you have permission from the owner to use. Please contact us at uk@arocha.org if you're interested in receiving any of the Environmental Encounters materials. A Rocha UK works with local schools in the Southall and Hayes area through the Environmental Encounters programme and through school assemblies, including the 'Green Father Christmas' assembly which has been particularly popular. In addition to these more formal links with schools, A Rocha UK also works with school children through park half-term specials and summer play schemes. A Rocha UK, in Hayes and Southall, is now focussing on transferring the skills used in creating engaging and stimulating resources at the Minet Country Park to the new Wolf Fields project.